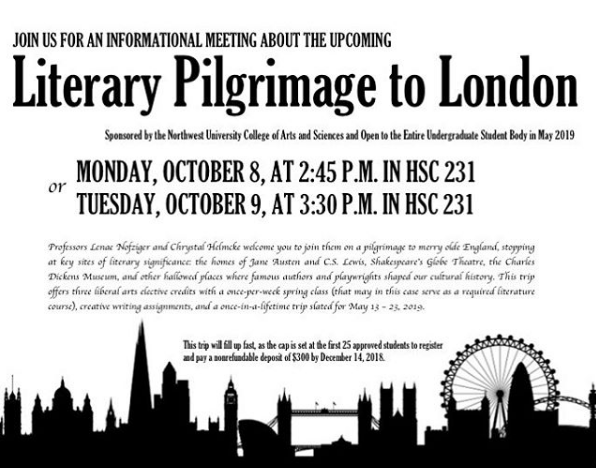 The The College of Arts and Sciences will be featuring their first international trip this spring: a literary pilgrimage to London. The trip will take place May 13th-23rd 2019. Guided by professors Crystal Helmke and Lenae Nofziger, this trip will allow students to explore London’s rich literary history through the eyes of a traveler, not a tourist. Nofziger hopes that students will be able to immerse themselves fully in London’s literature with and attitude of appreciation. The trip features a visit to the famous author C.S. Lewis’ house, the Jane Austen Center, a famous Shakespearean theatre, and Westminster Abbey among others. Helmcke expressed excitement for the opportunity to lead students on an international trip which allows them to experience new perspectives on different cultures. “Travelling outside your culture, even if it is a sister or cousin culture, affords us the opportunity to look outside of us and to think about how God would want us to think and feel about this experience,” Helmcke said. The class will meet one day a week prior to the trip and will prepare travelers for the experience. Student will learn about the history of London, how to travel and will get to write poetry in preparation. Offering three credits, the class can be used under the English, Drama or Communication categories. There is a maximum of 25 participants so spots will fill up fast and students are encouraged to sign up as early as possible. A $300 deposit is due by December 14th. The total cost of the trip and course is $3,300, including airfare, lodging, breakfasts, transportation, admission fees, and travelers insurance. For more information, pamphlets are available in Fee Hall.